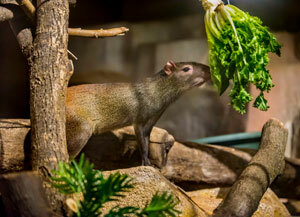 The Milwaukee County Zoo welcomes a male agouti to the Small Mammals building! 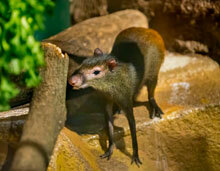 Agouti Santiago is now on public exhibit in the same enclosure as male sloth, Fezzik. A new species to the Zoo, the agouti is a rodent from Central and South America rain forests that looks a bit like a really large guinea pig. Its course hair is covered with an oily (and somewhat pungent!) substance that acts like a raincoat. An agouti walks on its toes, not flat-footed like many rodents, and has five toes on its front feet and three on the hind feet. The tail of an agouti is difficult to see as it’s rather small and almost looks like a dark jelly bean! Similar to other rodents, agoutis have teeth designed to gnaw on hard items, with one pair of sharp incisors in the front of the mouth. The incisors allow them to chew through nutshells; allowing them to crack through the hard outer shell of a Brazil nut with ease! Agoutis use their molars to grind their food. Favorite foods of an agouti is fruit, along with nuts. Having sensitive ears, it can even hear when fruit hits the ground, and then eats it upright, holding its meal with the front feet, just like a squirrel. In the wild, much of their time is spent searching for food, or taking a dip in a pool of water. During rest, this rodent species prefers to stay in a burrow or hollow tree trunk, safe from predators like jaguars and ocelots. Surprisingly, agouti can jump up to 6 feet straight up in the air from a standing position, spin around, land, and dart off in an opposite direction! Make the Small Mammals building a stop on your next visit and welcome Santiago!